With AFLAC, employee amounts may differ greatly based on the product an employee has elected to purchase. Since we have established the AFLAC benefit with the "1 to 1 Per Unit Rate Table", entering the employee AFLAC amounts is simple. 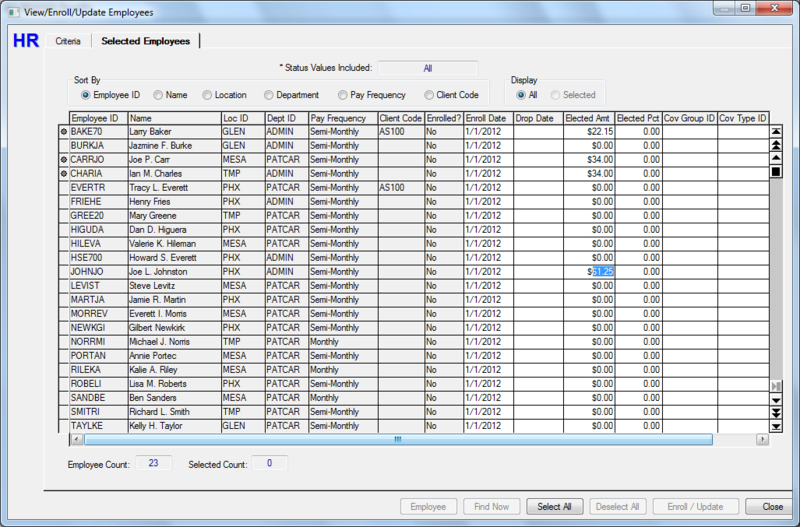 You now essentially have a quick entry grid for entering the AFLAC amounts appearing on the monthly invoice; simply enter the amount of the employee invoice in the Elected Amt column. Once these values are established, you do not need to re-enter them on a monthly basis. You should review your invoice against this grid to make sure that declarations have not changed, but you can update them easily.